I’m a vegetarian who flirts with being a vegan. I have a difficult time eating scrambled eggs most of the time and try not to eat too much cheese, but I still use eggs in baking and I still use items like honey. You’d think eating like that I would have tons of energy and overall feel wonderful, because we are what we eat, right? Well, that hasn’t been my case for a few years, but the past 6 months it’s gotten worse. The symptoms point toward celiac, but when my blood test two years ago came back negative everyone told me I was fine. Despite the signs, I just went along with what the doctor said. She was telling me about her son, and educated me more about gluten, how hard it is for some people to digest, how when that is the case, it can effect other areas of your body – like your skin. After trying her yummy Italian cookies, I was convinced gluten-free could also taste amazing. She told me after the holidays to try eliminating gluten from my diet for two weeks and see how I feel. Of course I took to the internet reading all the gluten-free information I could get my hands on, and one night after eating dinner and feeling incredibly sick, I decided that was it. It wasn’t waiting till after the New Year, I was going to try this now. 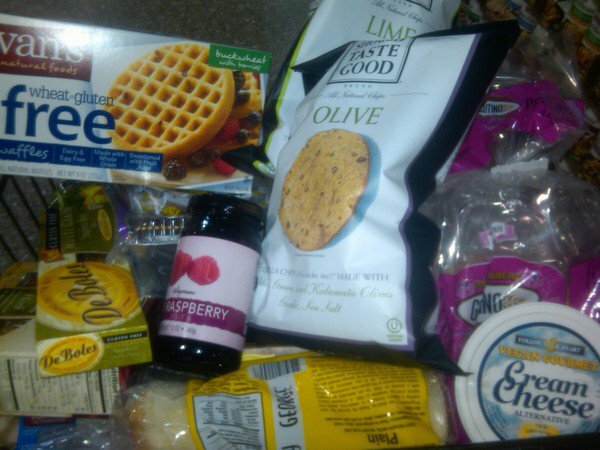 Well, $100 later, I left Wegmans armed with gluten-free everything. I started it Thursday night and the next day was able to eat breakfast and dinner without feeling like someone was stabbing me in the stomach. My energy soared, and at times when I normally would’ve been extremely tired, I was wide awake. Is this the cure-all? I don’t know. Will I cheat and eat struffoli from my favorite bakery in Little Italy at Christmas? Probably, but for the most part I’m going to try this gluten-free thing for at least the next two weeks and see what happens. If I ate meat and eggs, it would be much easier, but there are still a ton of stuff I can eat and so far, there has only been one item that tasted awful. I even cooked gluten-free pancakes this morning that everyone loved and didn’t even know they were gluten-free. The multigrain pasta from DeBoles looked just as good as the regular angel hair pasta I buy and tasted great, too. And, Pamela’s Products Dark Chocolate Chocolate Chip Cookies taste like brownie batter before you put the egg in it. The thing that is still getting getting me is the additives — the little things in the ingredient list that I didn’t know were not gluten-free, like soy sauce. It has wheat in it. Luckily, here in the Adirondacks, Price Chopper has a decent selection of gluten-free products and Hannaford as an even more extensive area. And, there is a Wegmans, Whole Foods and Trader Joes all close to my office, which makes things a lot easier. Any suggestions, tips or good websites you know of with helpful gluten-free information, I would love to hear about! I’d also love to hear other people’s stories about going gluten-free and their experience with gluten-free sensitivities. Previous Post Welcome to the Redesigned The Adirondack Chick! After three years I was diagnosed, and now I would never ever go back to eating gluten or wheat. I feel 100 percent better. Good luck.